The two days of Exeter’s Two Short Nights film festival saw more than 42 short films screened at nine separate events, which were visited by hundreds of people. It was a fantastic year for filmmaking and the level of talent was evident from the start. 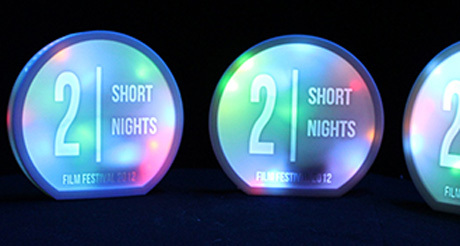 Beginning with the 48-Hour film challenge and right up to the short film commissioned filmmakers, the dedication and celebration for short film made Two Short Nights 2012 one of the best yet. Many congratulations to this year’s winning filmmakers. Nicola Tetlow for her film Watch me Dance, and filmmaker Michaela Morning, for POLEDNâ€ CE, were both awarded joint Best Bursary Award at this years award ceremony. Festivalgoers awarded Jerri Hart the Audience Award for his film The Oliver Complex, which was screened at the Premiere screening on the Friday night of the festival. The award for Best International Short Film went to Martin Rosete for his incredible film Voice Over, which was screened at the International Open Screening 2. It was a tough choice all round for this year’s film panels, but the 48 Hour Film Challenge was especially difficult to judge following the impressive quality of the films. The panel finally awarded team Never Coming Home with the Best 48 Hour Film Challenge for their funny, yet beautifully shot film Balloons. The 2012 awards were presented by director Hugh Hartford, who has had recent success with his BRITDOC film Ping Pong, and who was part of a team of filmmakers who were awarded a short film commission by Exeter Phoenix six years ago.